After the January 31st attack (see Reserve platoon), Harry Schaefer’s company G and the rest of his Regiment resumed the advance to the east and recaptured most of the ground lost in December. On February 03, 1945, General Lauer issued Field Order #5 in which the division was ordered to relieve the 82nd Airborne Division. The 99th Division was ordered to move into Germany and consolidate a 13.000 yard front from the vicinity of Hollerath down to Losheim in the south. Schaefer and his men were deployed south of the blood soaked ground of Udenbreth, taken a few days before by the 82nd Airborne’s 325th Glider Regiment after bitter fighting and important casualties. 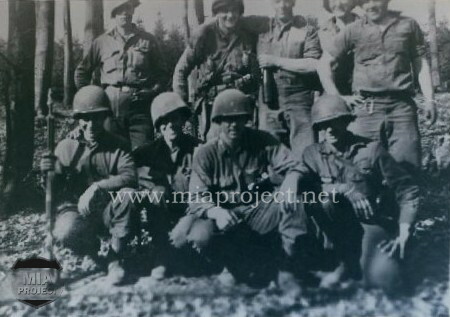 2nd squad, 2nd platoon of G company, pictured on March 21, 1945 in the Remagen bridgehead. S/Sgt Schaefer is first from right kneeling. On his right is 1Lt John Loftus. “… It was Feb 3, 1945. We had just finished cleaning up the area pinched off by the 9th Division on the left and the 2nd Division on the right. After two days of licking our wounds, we were assigned to relieve the 82nd Airborne Division in the Weisserstein area where we had been prior to December 16th. We, G Co, were trucked to California Road, very close to where we had come out of the woods on December 17th ( see withdrawal through Mürringen). We then went east thru the forest and on to where the 82nd was dug in. On our way, I passed by the body of an 82nd trooper. He no longer had any use for his Thompson sub-machine gun so I relieved him of it as well as all the ammo clips he had. The clips came in pairs, taped together so that when one was empty all you had to do was turn it over for another 20 rounds. We moved into our new area, and after the formalities of being shown the location of the outpost and the foxholes the 2nd Plt was to call home, the 82nd said us goodbye. Now we had officers in charge of the Platoons but the 2nd. Lt Burtner was not back from his wounds of the 18th December, Lt. Loftus was still the Company Liaison with battalion and as Platoon Sgt, I was still in charge of the 2nd Platoon. I wondered why the 2nd Plt was assigned these positions because the CP was a bunker of the West Wall. The others were CP’d in holes with plenty of water so you can understand my bewilderment at drawing a dry bunker with a 6 foot thick concrete roof. We settled in to our new digs and joked about our new firepower. In addition to my new found weapon, Sgt Don Thomas had also fallen heir to a Thompson and PFC Gene Heald had liberated a Burp Gun (Note: German machine pistol). We retained our M1’s because our new ‘toys’ were only good until the ammo ran out. Riflemen aren’t on the draw list for 45 ammo and Heald would have to liberate his 9mm ammo if he wanted any more. The first night went by without incident and it was even nice to be sleeping on a bunk, high and dry. I left a skeleton crew out, backing up the outpost, and the rest of the men shared the comfort of the ‘bunk house’. There were probably 40 canvas on pipe frame bunks in the ‘bed room’ of this bunker. There was a kitchen, conference room and headquarters room in addition to the ‘bed room’ in this particular bunker. The word soon got out that Schaefer had spare beds in his hotel and we soon had other members of the battalion spending the night with us. This was fine until one officer wanted one of my guys to give up his bunk so he wouldn’t have to sleep on the floor. The entire platoon is still laughing.